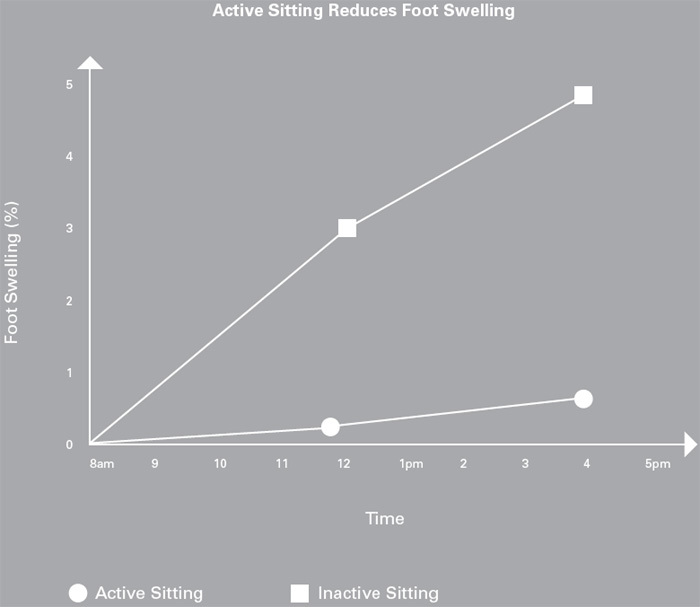 Studies have shown that 70% of all women and 40% of all men have health issues such as blood clots, varicose veins and pressure on the Achilles tendon due to pooling of fluids in the lower limbs - the result of prolonged, inactive sitting. The foot machine, with its ball-bearing, roller design encourages gentle rocking of the feet in the same way a rocking chair encourages movement. This rocking motion uses most of the lower leg muscles and increases healthful circulation. The foot machine also performs as a standard foot rest, providing support for the legs and relieving pressure on the lower back. Our Foot Machines get your feet moving for health and comfort. They offer relief from prolonged, inactive sitting by encouraging a gentle rocking of the feet, which uses most of the lower leg muscles to increase healthful circulation. Our Foot Machines also raise the feet to relieve pressure on the lower back when sitting. 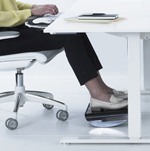 Making movement at the workstation simple, our range of dynamic footrests is designed to maximize comfort while promoting an active workspace. Each with distinct features to enhance wellness, our footrests raise the feet to relieve pressure on the lower back and encourage gentle rocking, which uses the lower leg muscles to increase circulation and boost energy. Our foot machines, which were created to be simple to use and look elegant in any space, also help to reduce swelling and discomfort in the lower legs during prolonged periods of sitting. A highly ergonomic work environment is built around four primary tools - task chair, articulating keyboard/mouse support, adjustable monitor arm and task light that work together to improve the health and comfort of computer users. The absence of any one of these four tools may impact the ergonomic benefits of the others, whereas additional components, such as foot rests, can further improve the workstation’s ergonomics. To better understand how the ergonomics leader can dramatically improve your workday with the right assessments, tools and training, contact your Humanscale representative.